Soldiers from the ISIS terrorist group in eastern Syria have been forced into a tiny pocket with their families after President Donald Trump vowed to destroy the final remnants of the group. 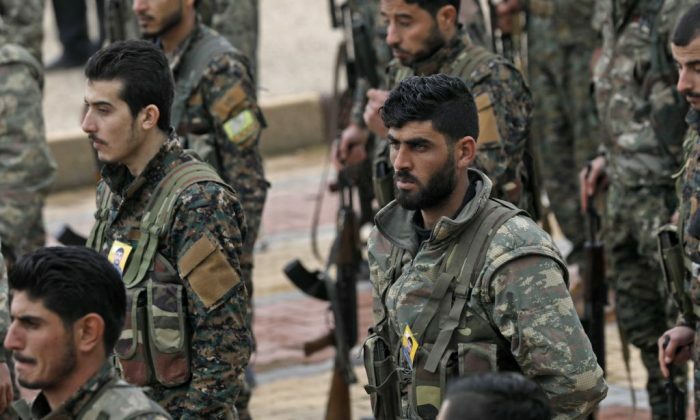 Backed by 2,000 U.S. troops, the Kurdish-led Syrian Democratic Forces (SDF) said they are in a final showdown against ISIS after helping to drive the soldiers from the towns and cities that once formed the group’s self-proclaimed caliphate in Eastern Syria. The SDF said Jan. 29 that the presence of the soldiers’ wives and children meant the U.S.-backed militia could not launch an all-out storm of the enclave and instead would have to use more measured and precise tactics, which has slowed the advance. In the meantime, The International Rescue Committee (IRC) charity said 10,000 civilians had fled the enclave since last week and were arriving hungry and desperate at a camp. SDF spokesman Mustafa Bali said ISIS soldiers were now confined to an area of about two square miles by the Euphrates River. The SDF had refused an offer from the jihadists via mediators to surrender the territory in return for safe passage out, Bali said. “Calm prevails on the frontlines but there’s a state of caution and waiting,” he said. Bali said on Jan. 13 that their forces had ramped up attacks and had cut off an escape route. In December, President Donald Trump announced the withdrawal of 2,000 U.S. troops from Syria, citing the defeat of ISIS and that U.S. forces were no longer needed there. A Department of Defense spokesman confirmed on Jan. 11 that the coalition has started the withdrawal process. In a series of tweets in mid-January, Trump said he would continue the pullout while at the same time ensuring the complete destruction of ISIS. He said he did not want the Kurdish forces to provoke Turkey into war. Kurdish leaders also fear a U.S. pullout would give Turkey, which sees the Kurdish militia as a threat on its border, the chance to mount a new assault. The Trump administration has since said it will make sure its allies are protected when it leaves. After Trump’s abrupt announcement on the troop pullout, three senior Pentagon officials resigned. They include Defense Secretary Gen. Jim Mattis; Rear Adm. Kevin Sweeney, the chief of staff to the secretary of defense; and Pentagon spokeswoman Dana White. Meanwhile, in the Middle East, negotiators for the United States agreed to a draft a peace deal with the Taliban on Jan. 26, according to Taliban officials, drawing closer than ever to ending the United States’s longest war. The deal, which isn’t official until agreed to by both sides, calls for the withdrawal of foreign troops from Afghanistan in 18 months in exchange for a ceasefire from the Taliban, among other items. Taliban sources provided the draft pact to Reuters.